Both heavy snow and rain are blessings of nature of Akita. 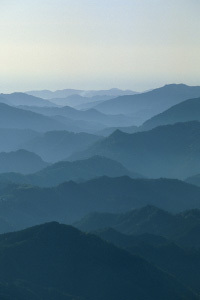 Akita is surrounded by the Shirakami mountains on the northern side, the Ou mountains on the eastern side, and Mt. Chokai on the southern side. The wind from the Continent of Asia contains humidity from the Sea of Japan and then brings a lot of rain and snow. These blessings of Akita’s nature create refined sake, “Takashimizu”. Takashimizu main brewery stands in the area called “Kawamoto”, where three rivers (Omono river, Asahi river and Taihei river) gather and is famous as a source of the purest water. This pure water is fundamental importance for sake brewing in Takashimizu. 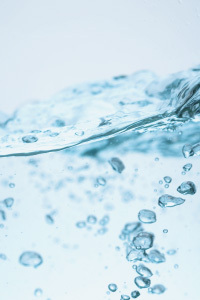 It is generally said that there is much soft water in Japan, while there is much hard water in western countries. The water hardness for Takashimizu sake is 49.7, and this is quite soft. This softness is suitable for low-temperature and long fermentation sake brewing method in Akita. Iron is the most unfavorable mineral in water. If sake contains certain iron, it has a reddish brown color, and its taste and aroma are unpleasant. The iron concentration in water for sake making must be less than 0.02 ppm, which is much lower than ordinary tap water (0.3ppm or less). Water for Takashimizu contains little iron. It can be said that sake brewed with our water contains refined taste.